Taking younger characters from cartoon shows and aging them is hardly a new phenomenon. Hell, it’s practically an internet obsession. But those “age progressions” are usually performed by fans. What is unusual is when someone who actually worked on one of those shows gets involved. That’s definitely the case with Eric Molinsky, a storyboard artist who worked on Rugrats, The Wild Thornberrys, As Told By Ginger, and Rocket Power. He’s seen all of those other “What would the Rugrats look like as grownups?” articles, and he thinks they miss the mark. So he decided to do one himself. In the article accompanying his drawings, he describes how those other artists got it wrong. 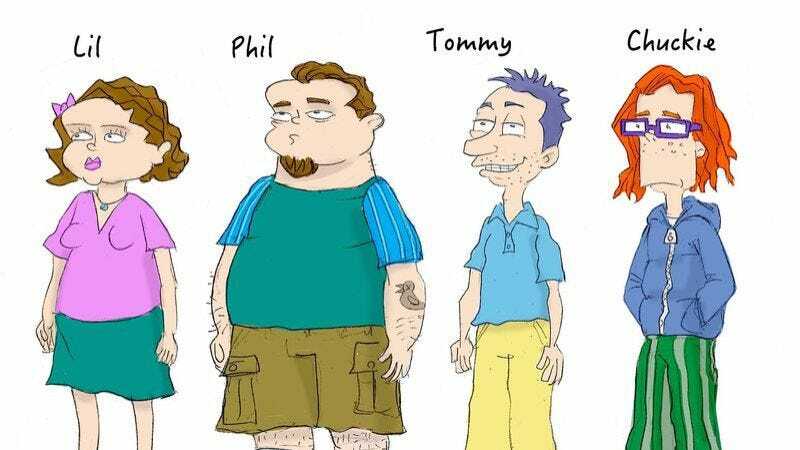 The Rugrats did not all grow up to be fashion models or self-confident hipsters. Especially not Chuckie. They probably grew up to be average if not slightly lumpy looking people—just like their parents. Here, then, are Molinsky’s decidedly unglamorous, achingly unhip versions of the characters as adults. Yep, that’s Angelica in a pantsuit down there, probably yelling at a customer service rep. Only Dil and Kimi have maintained any semblance of semi-hipness, he with a wallet chain, she with a nose ring. Any potential cool points awarded to Phil for his tattoo and goatee are nullified by his billowy cargo shorts. Chuckie? Miserable as always. Tommy looks unwholesome, like he has to notify the neighbors before he can move into a new house. Molinksy insists that these drawings, deflating as they might be, are true to the spirit of the show. “We referred to them as lumpy babies for a reason,” he writes. “If we ever drew the Rugrats as being too cute, our executive producer would scold us.” Under those circumstances, Molinksy’s bosses would be quite pleased with these depictions.